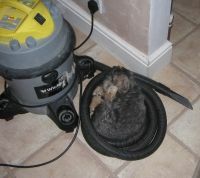 A selection of puppy related photos from our previous litters. 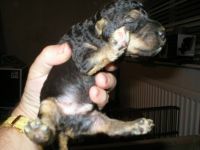 We occasionally have puppies available, please drop us a line & we will update ! 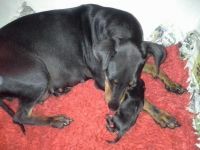 As you will see, all our puppies are Blues (born black), we have previously however had one blue & tan boy. 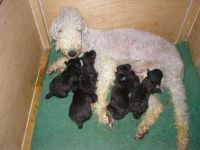 Why are Kennel Club endorsements placed? The use of Kennel Club endorsements is undoubtedly beneficial to breeders as a measure to help in protecting stock which has been carefully and responsibly bred. 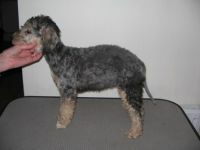 It is generally assumed that breeders endorse their stock to safeguard the dogs future, the breed and themselves. All of our 'JANMARK' puppies are sold with Breeding and Exporting endorsements on them that will be fully explained to potential owners when you visit us. These endorsements may be lifted at a later date depending on certain criteria. 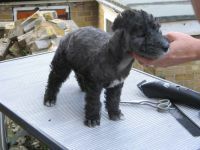 We will also take back any dog bred by us at any age and under any circumstances. 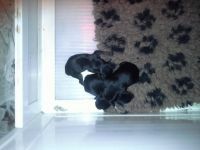 We occasionally have puppies for sale to selected homes, please feel free to contact us for availability & details. 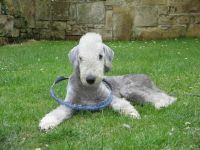 If you require any general information on bedlington or Manchester terriers, please dont hesitate to get in contact, if at all possible I will try to assist you.